The loss of our wildflower-rich grasslands due to development, herbicides, climate change, and competition from introduced plants are impacting native bees and other pollinators, now experiencing simultaneous dramatic declines. Because native wildflower seed banks may no longer exist on their former sites, everyone should help bring back lost native plant species, which is what we are attempting to do at Carpenter Farm Park. Viable food webs: Native birds and other wildlife specialize in insect diets often consisting of native butterflies and moths. For example, eighty percent of a hummingbird’s diet consists of insects, and ninety percent of our bird populations rear their young on lepidoptera (caterpillars), and arthropods (spiders that also raise their young on lepidoptera). Finally, the butterflies and moths that survive birds and spiders go on to pollinate many of our native wildflowers. Ninety percent of the insects that eat plants can only eat those with which they co-evolved. So what are the best plants for our native butterflies and moths to eat while in the larval stage? Doug Tallamy, author of Bringing Nature Home, has a list: The number following the plant(s) represents the number of lepidoptera species that feed upon that host genus. People often ask what evergreen shrubs and trees are good for year-round screening that also benefit wildlife. This comprehensive list is from The Living Landscape by Rick Darke and Doug Tallamy. 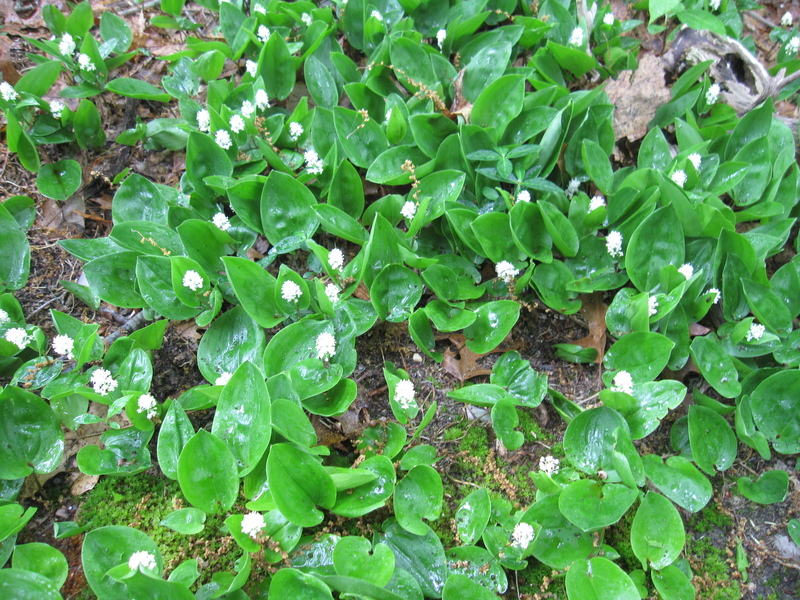 On the last day of May I walked through my backyard woodlot to see what plants were coming up. 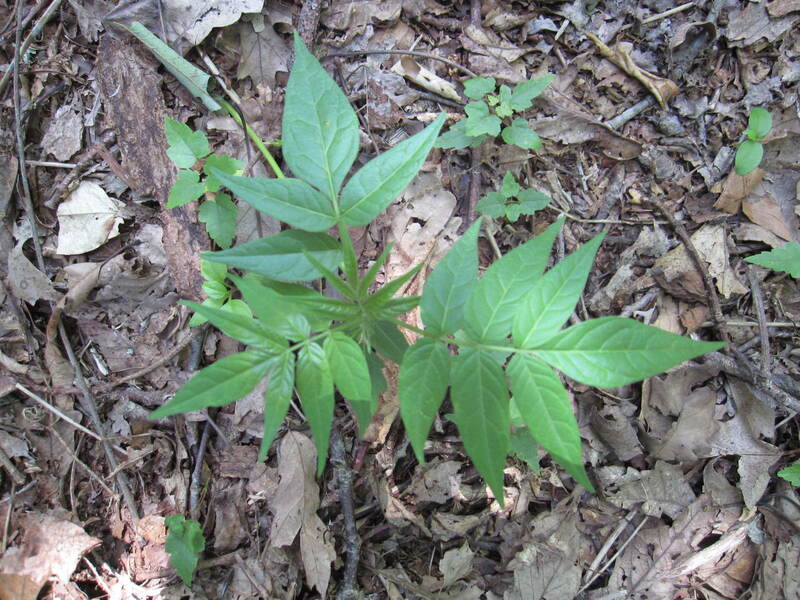 Since I’ve succeeded in eliminating most invasives I happily discovered native Canada mayflowers, Mayapple, wild geranium, Solomon’s seal, enchanter’s nightshade, goldenrod, trillium, Virginia creeper, tulip and sassafras trees and small shrubs of raspberry and blackberry. 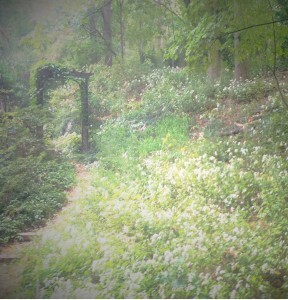 White wood aster is appearing throughout and is doing its job of shading out invasive seeds. 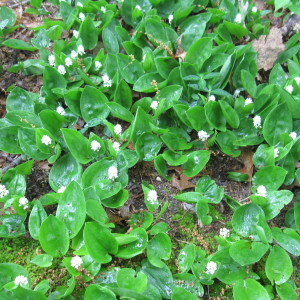 In some open spaces, however, invasive seedlings are nudging their way through. I discovered the non-native Indian strawberry, which at first glance I took to be a native strawberry species — but with smaller, rounder red fruit. 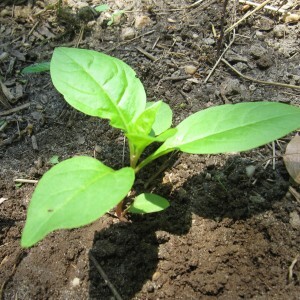 I uprooted and collected the plant and added it to my solarizing bag of weeds sitting out in the sun. One thing that struck me was how similar the leaves and runners looked to native raspberries, but minus the prickles. 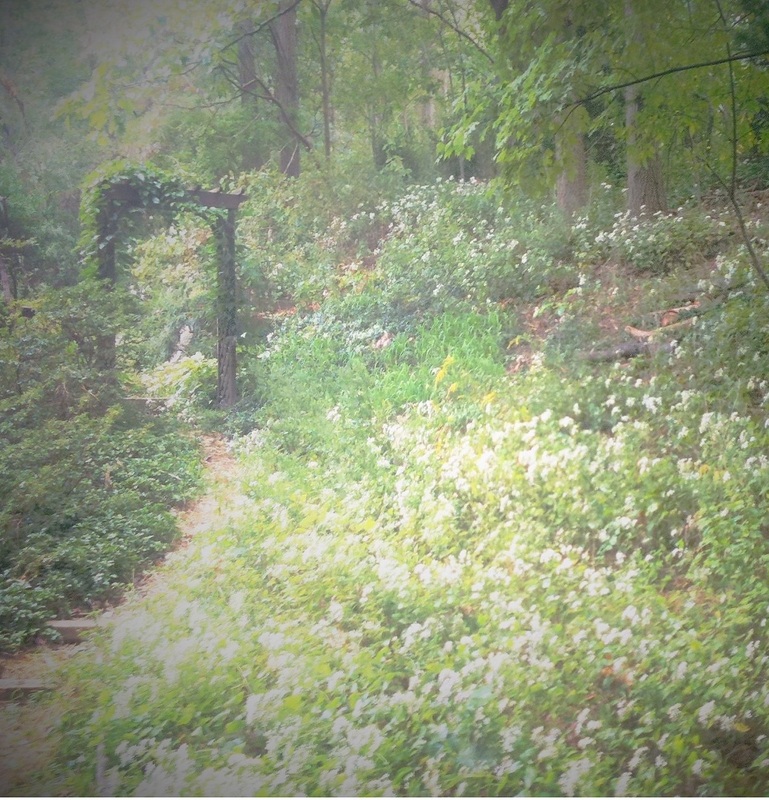 Seeds of invasive plants find their way to my property from my neighbors, brought there from their neighbors… and so on. 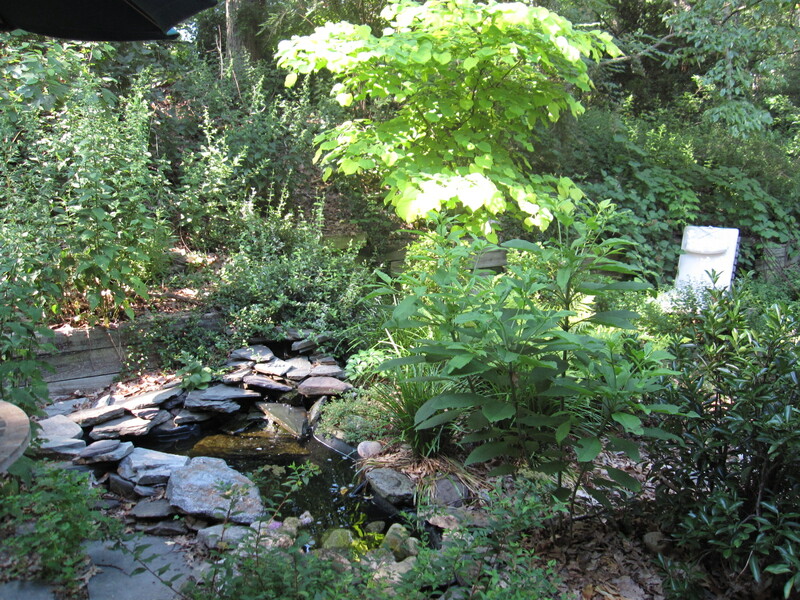 Typically, when land is disturbed and open up for yards and lawns, the native trees, shrubs, ground cover and deep mulch that once served as barriers to slow the movement of bird-transporting and wind-borne seeds also shaded seeds from germinating. One might notice that sun-loving invasives don’t generally penetrate large, mature forests, except around the edges. This is known as the edge effect. What might serve as a buffer between neighbors could be a fence or low hedge to demarcate property lines, but seeds, runners and rhizomes easily cross the border. What’s worse are weeds that spread when grass clippings are collected and dumped in the corner of buffer zones where they grow onto neighbors’ properties. That’s why clippings should be left on lawns. With or without the help of mulching mowers, lawns should be mowed weekly during the growing season. The general practice is to mow the grass when it is 3 inches high and, following the 1/3 rule, cut off no more than 1 inch of that height. 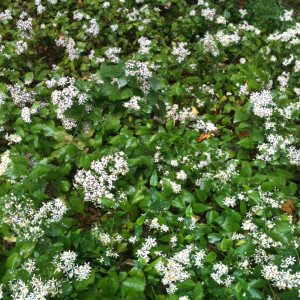 Routine mowing will help keep weeds such as mile-a-minute weed in check. Three inch high grass will shade many weed seeds, preventing germination. The ubiquitous tree-of-heaven seedlings are everywhere except under my beautiful white wood asters, which is one of many reasons why I love this plant. White wood aster is an aggressive native Long Island species that grows in partial and dense shade under deciduous trees. I find rabbits nibble the leaves, native bees and other pollinators enjoy the nectar in late August when little else is blooming, and native sparrows eat their seeds in the fall. 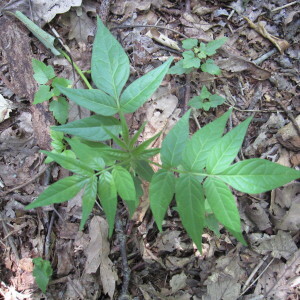 Early last July I marked out a 7′ x 8’area in the woods that contained 135 tree-of-heaven seedlings, uphill of a small patch of aster. By August the count was 70, and only 3 seedlings remained by September 5, 2014. So far this year the size of the aster patch has more than doubled and is moving uphill, plus a large branch from a native spicebush is adding more shade to the area. 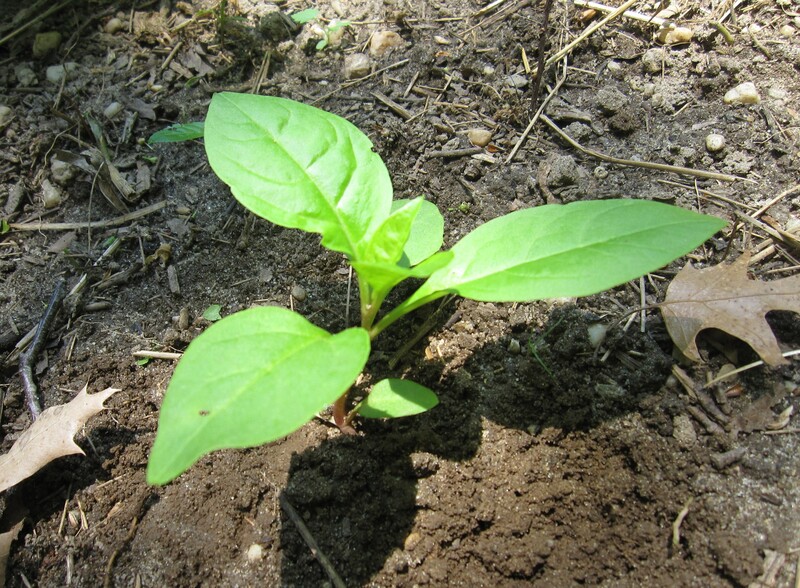 Today I counted only two very small tree-of-heaven seedlings. So whenever I spot these seedlings I decide whether the shade is dense enough to halt its growth or pluck it out. To uproot them I use a hand-held weeder or a nearby twig to loosen the soil as I pull each small stem and root. 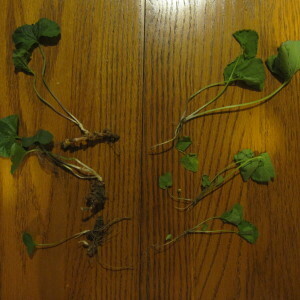 The roots are so viable that if laid on the ground to dry they can re-root. The other ubiquitous invasive I keep finding is garlic mustard. Some are the first year’s seedlings, which I simply uproot and leave, and uproot and solarize those with flowering stems and seedpods. I’m careful not to pull out anything I don’t recognize, but will seek help online to identify the plant — as I did when I first spotted what turned out to be white wood aster. For really tricky IDs try Flowers Forums. Last year I let an area of wild blackberries grow and then cut them back early this year to plant some arrowwood viburnum and elderberry. Now the blackberries are growing out-of-control and I wonder what species they are. Two likely candidates are our common native Allegheny blackberry or some non-native species. An online search indicates that they all have three and five leaflets and ribbed canes. Either way I decided (wisely, I think) to dig them up. The large stems of blackberries have deep root crowns that must be dug out or pulled with a large weed wrench (available online). 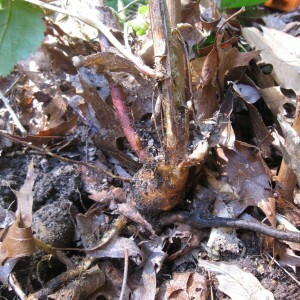 The horizontal rhizomes that spread laterally from beneath the crown should also be removed, since young shoots emerge from them. 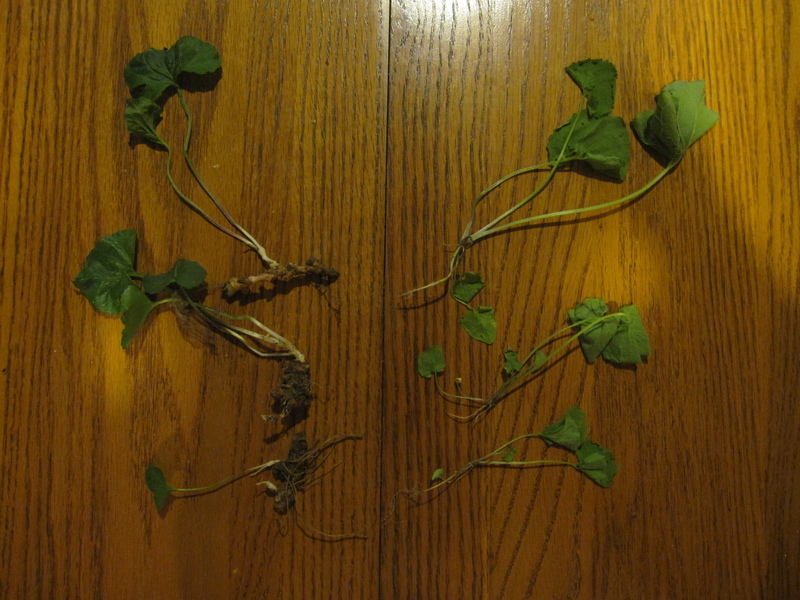 I used a hand weeder to get under the shoots and pull up the rhizomes. Will return in a few weeks to remove new growth as many roots and seeds still remain in the ground. So the question arises, what to do about unwanted or nuisance native species that benefit wildlife but get out-of-control. I’m talking about poison ivy, pokeweed, grape ivy, and Virginia creeper. My thoughts are that where these plants are growing or likely to grow should be the determining factor. Poison ivy and pokeweed…not where people and pets may wonder; grape ivy and Virginia creeper…not near wanted trees and shrubs. 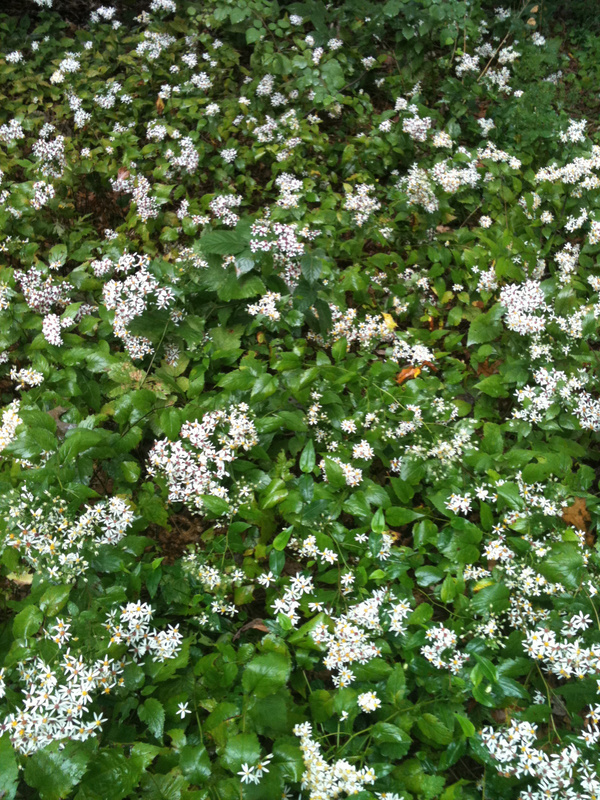 Above: in the foreground is native white wood aster, Eurybia divaricata. This species of aster is a beautiful shade loving weed suppressant; blooms throughout September; and is a source of nectar and pollen for native pollinators. 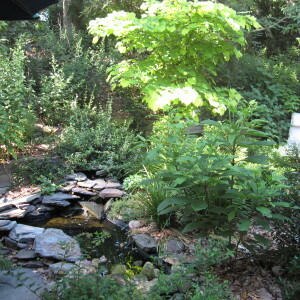 Below: The 5 foot tall plant in the foreground is a beautiful Joe-Pye weed Eupatorium, growing in front of a native eastern redbud Cercis canadensis tree. Growing up to 16 feet high, this tree — whose rose colored blossoms flower in spring — is often planted as a small ornamental.